A glass for (most) every style. Beer EssentiALES are a new product from Social Ave., distributed by long-time glassware producer Luigi Bormioli. I wouldn’t review beer glasses without something to make them interesting and in this case there were two things. First, I have a couple sets of Luigi Bormioli cocktail glasses and really like the look and feel of them. Second, they are targeted to craft beer drinkers. Note the set of glasses I used was provided to me by the manufacturer. 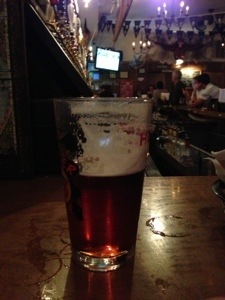 The beer consumed was provided by me. I’d recommend these if you you’re looking for some interesting, nice looking beer glasses. As of 5/29/12 the only place I can find these online is Everything Kitchen ($29.99) but they should be on Amazon soon. I saw this pop up on Urban Daddy the other day and just got the press release below. Dying to go now. New York, NY [January 19, 2012] – Top Hops Beer Shop is now open at 94 Orchard Street on the Lower East Side in Manhattan. A retail store and tasting bar designed to showcase great beer from around the world, Top Hops offers a selection upwards of 700 brands, both American craft and import, available for purchase and on-premise imbibing. Top Hops encourages people who are passionate about beer to come together to share their enthusiasm and gain a better understanding of the magic that is hops, yeast, barley and water. And to make Top Hops a true hub for dynamic beer experiences, Top Hops will host guest brewers, visiting beer writers and beer pairing seminars. Serious beer drinkers, however, are in for a treat. A 30-foot custom-built wood and polished aluminum bar invites customers to belly up and enjoy a tasting flight or a glass of any of the 20 beers on tap, as well as any bottle available in the store. Five of the 20 taps are dedicated to regional breweries including Greenport [Long Island], Kelso [Brooklyn], Captain Lawrence [Westchester, NY], Troegs [Hershey, PA] and River Horse [Lambertville, NJ]. Rotating taps will feature seasonal beers, limited editions and other hard to find selections, both domestic and imported. Growlers are available in 64-oz and 32-oz sizes for take home. Here’s a fact that will make beer geeks smile, and give everyone the chance to taste the beers as they were meant to be tasted: Top Hops cleans their own draft lines and never goes longer than two weeks between cleanings. They are fanatic about clean draft lines. A blackboard behind the bars lists the date that each line was cleaned along with other pertinent details, including the date the keg was tapped, IBU, style, brewery, brewery location, and a description of the beer. The bottle selection consists of nearly 700 brands and spans the globe with unparalleled breadth and depth. Top Hops works tirelessly to offer an unprecedented selection, with possibly the best selection of Belgian beers in New York City, including DeuS, Glaven Toren Saison and Contreras. Approximately half the inventory is dedicated to American craft beers, including offerings from cult gypsy brewers like Brian Stillwater of Stillwater Artisanal Ales. A small menu of beer-friendly items is available, including a rotating selection of cheeses, charcuterie, olives, Mast Brothers chocolate and German-style pretzels, all sourced from The Essex Street Market around the corner. A small selection of wines by the glass, as well as non-alcoholic beverages, are also available for non-beer drinkers. A native New Yorker, Ted Kenny spent 12 years in finance before seeing the light and moving to the beer business in 2006. He worked for the Anheuser-Busch/In Bev brewery and then distributor, learning something every day about beer. Kenny is a Certified Beer Server from the Cicerone Certification Program and is on his way to becoming a Certified Cicerone. Similar to the process of becoming a Master Sommelier, a Certified Cicerone undergoes an exam that demonstrates a vast knowledge of beer, from its history, its different styles and how to pair them with food, as well as a working knowledge of draft beer equipment and proper storage. Architect Russell Glover has created an inviting space using a palette of concrete, wood and aluminum – all the materials commonly found in a brewery. The heart and soul of the store are the two 26-foot long glass refrigerators that hold the cold bottles (organized by place of origin) and kegs that hug the right and left walls of the store, underneath an arched white-washed ceiling designed to look and feel like a beer cave. Top Hops is located at 94 Orchard Street, New York, NY 10002; Telephone: 212-254-4677; Website: www.tophops.com. Top Hops is open seven days a week: Monday, Tuesday and Wednesday 2:00pm-10:00pm; Thursday 2:00pm-11:00pm; Friday 2:00pm-12:00am; Saturday 12:00pm-12:00am; Sunday 12:00pm-8:00pm. Shmaltz Brewing celebrates its 15th year of brewing with the Limited-Edition release of Genesis 15:15®. Happening Tuesday, November 15, 2011, beer bars across NYC will partner with Shmaltz for a one-night-only affair! The following 15 bars will have a keg of Genesis 15:15® on draft, starting at 5:15 pm: Queens Kickshaw, MexiQ, Rye House, Rattle N Hum, George Keeley’s, Valhalla, Tap Room, Dive 96, Swift, Blind Tiger, Puck Fair, Mugs Ale House, Black Swan, 4th Avenue Pub, and The Double Windsor. A bold and decadent 13.4% ABV Harvest Barleywine aged 9 months in Sazerac 6-Year Rye Whiskey Barrels, Genesis 15:15® is the 5th release in Shmaltz’s Limited-Edition Barrel Aged series. Genesis 15:15® incorporates fruit juices from the Sacred Species listed in the Torah: figs, dates, grapes, and pomegranates. Harkening back to HE’BREW’s® original Genesis Ale® – a beer brewed with pomegranates that were hand-squeezed in Shmaltz owner Jeremy Cowan’s San Francisco apartment – Genesis 15:15® symbolizes the evolution of Shmaltz from a humble, self-distributed start-up to one of the most creative and respected craft brewing companies in America. Genesis 15:15® was also inspired by Genesis 10:10®, a 10th anniversary, 10% ABV pomegranate strong ale whose popularity led to the subsequent commissioning of Origin®, a year-round Imperial Amber Pomegranate Ale. Sounds like a good reason for me to stop by Blind Tiger after a meetup tonight. They love it so much that they are running a contest which will be promoted in various pizza places and Italian restaurants in New York City, Boston, Chicago, and South Florida as well as their Facebook page. What are the prizes, you may ask? Moretti and East Village Radio hosted an event a couple weeks ago here in NYC to announce this and were kind enough to invite me. They were also kind enough to give us free beer, pizza and a schwag bag. 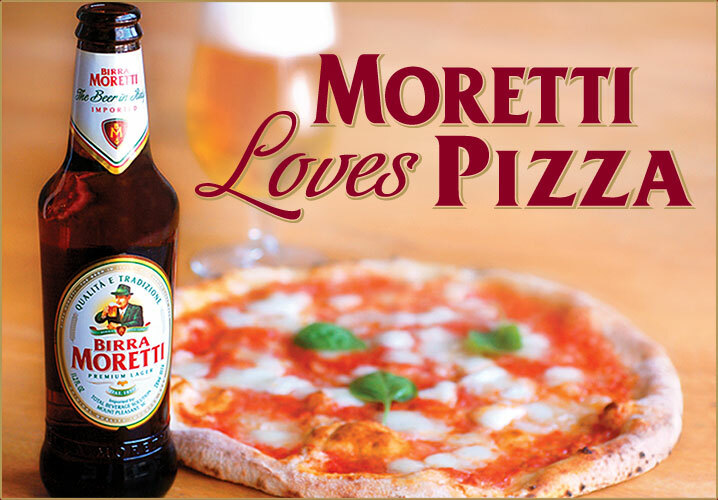 The last time I had a Moretti was years ago at a coffee shop so I didn’t really have a strong memory if I like their beer or not. I tried their lager first (on draught) and wasn’t terribly impressed. Not bad, but nothing worth telling anyone about. Next I had the La Rossa (also on draught) which they describe as a double malt. This was the beer I remember having in the past and it was pretty tasty. This sentiment was typical of the 4 or 5 people I talked to at the event.